Hamburg-based Enteractive, one of Europe’s pioneer BD production studios, demonstrated for the first time at MEDIATECH its BD-Live Video on Demand service 'Videociety' – a digital pay-per-view video delivery service that lets users rent movies via their Blu-ray player. In a nutshell, Enteractive's ground-breaking videociety technology transforms a Blu-ray player into a Home Entertainment Centre with access to a video delivery service. 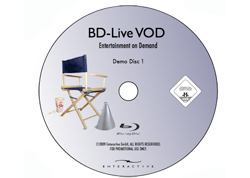 A Blu-ray Disc runs a specialised Java software application acting as a Client (browser). The Java application synchronises with the Java operating system inside the Blu-ray player, controlling and performing all the necessary tasks to ready the delivery of movies from a dedicated content management system and video server. The movies are encoded in the high quality MPEG-4 (H.264) video format with either Dolby Digital 2.0 stereo and 5.1 surround audio. Videociety will be officially launched at Berlin’s IFA in September. The company is currently in negotiations with all major and independent studios to secure content for the service. Enteractive is part of the Splendid Media Group. Together with their sister companies Splendid Film, Polyband and WVG Media they have a portofolio of more than 400 movies, which will be offered on the service. Enteractive itself provides the complete turnkey solution and platform with its partner Akamai Technologies. The company takes care of customer relation, billing, parent control, copy protection, access and marketing of the service. "Enteractive plans an extensive marketing campaign for the launch of a bespoke VoD service in the autumn, including promotion with Blu-ray hardware manufacturers, advertorials in the trade press and popular AV magazines as well as an Internet campaign to bring personal-TV via BD-Live into the living room," adds Henseleit.